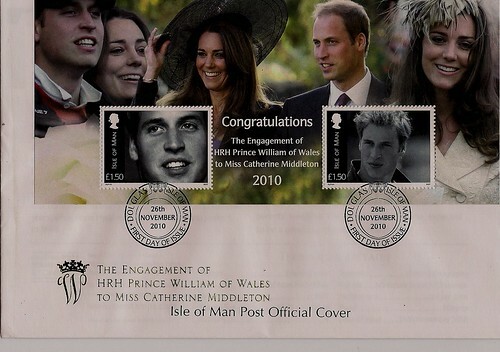 This FDC issue celebrates the royal engagement of HRH Price William of Wales to Miss Catherine Middleton and was issued by Isle Of Man Post on 26th November 2010. The long awaited official announcement came on 16th November this year from Clarence House followed by a private engagement ceremony held in Kenya while the couple were on holiday. Miss Catherine will be the first commoner to marry an expected future king for 350 years since Anne Hyde married the future King James II in 1660. Fellow Isle Of Man collectors may notice that the two stamps used in this MS was originally issued on 9th June 2003 to mark HRH Prince William's then 21st Birthday celebrations.